When I set out to choose my dream bike this year, I was pleasantly surprised. It was the first time that I needed an entire hand on which to count the number of women's bikes that didn't require component changes out of the box. The 6-inch-travel, carbon Specialized Rhyme 650B is one of those. It already comes with an enviable parts package including a RockShox Pike RC, a women's-tuned Fox Float shock, Shimano XT brakes, a SRAM X1 single-ring drivetrain and nice, wide Roval wheels. I didn't feel like I had to change anything, but what kind of dream would it be if I didn't get a little reckless with the wallet? First, I traded the aluminum Roval Traverse wheels for the 30-millimeter-wide carbon-fiber version–wheels that have already proven their durability and increased stiffness and cornering traction over the past year of riding. 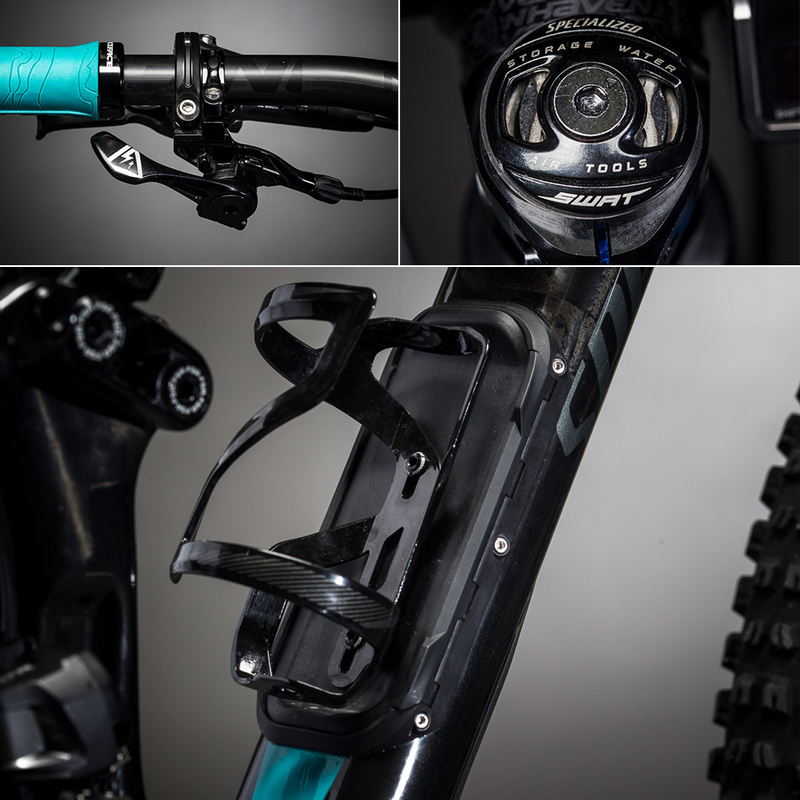 I was happy to keep the fork as-is, but I'd hoped to exchange the lighter-tuned shock with Fox's new Float DPS with the EVOL extra-volume air can for added plush on the descents. Unfortunately, the shock-mount on the Rhyme is too narrow for the extra bulk of the EVOL air can, so I had to let that part of my dream go. I made the biggest change with the drivetrain, swapping the stock one-by drivetrain for Shimano's 2X electronic XTR. I realize that adding more gears is unconventional these days, and I appreciate the simplicity of a single-ring set-up as much as the next front-derailleur-frustrated rider. But, Shimano's Synchronized Shift got me thinking: What if I could control both derailleurs with one lever? Maybe front shifting has improved in the two years I've been away? I've only missed it a couple times, both instances when I was riding big mountains at high elevation when I would've made out with a mountain goat if it somehow made pedaling easier in the thin air. 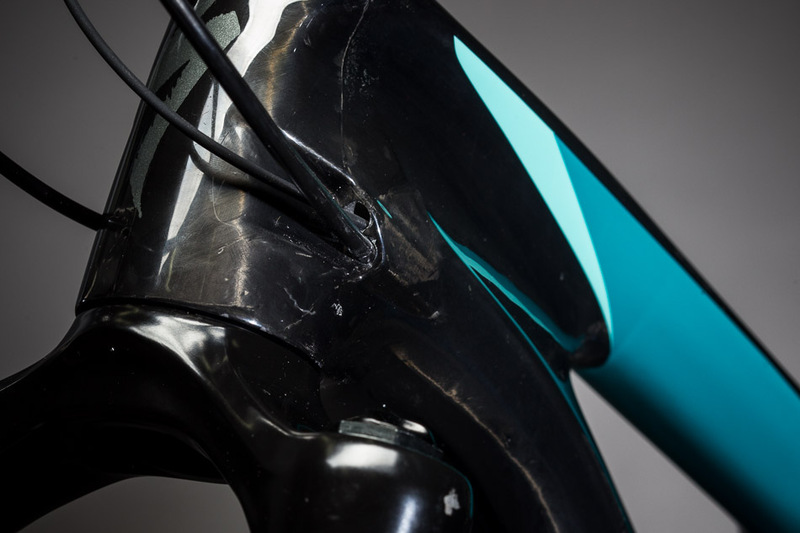 There was one problem–Specialized uses the 'Taco Blade,' which is designed specifically for SRAM's front derailleur. This caused our gear editor a few grey hairs, as he had to resort to power tools to modify both the Shimano front-derailleur mount and the Taco Blade so they would play well together (which they do). 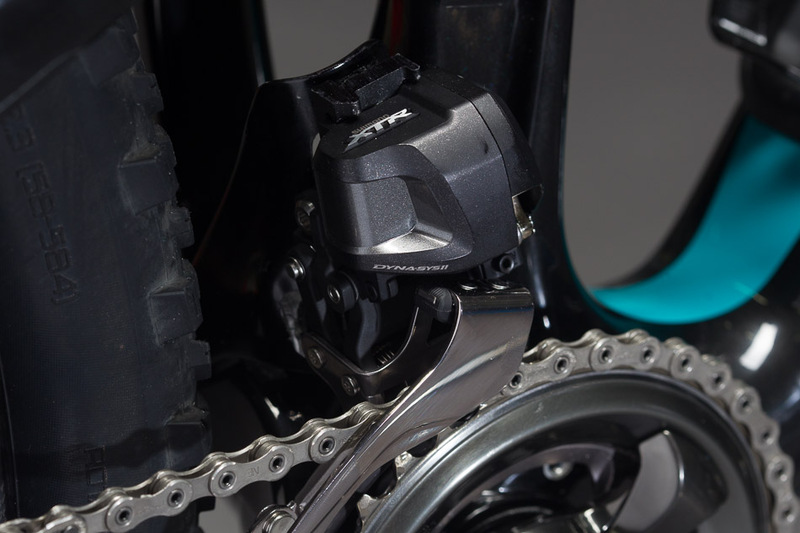 Despite the fact that you can only program the Di2 platform on a PC, it has some pretty cool features, like setting up the system to control both derailleurs with one shifter, or pinpointing the precise rear cog the system will shift into when you switch between the big and small rings. So far, the electronic system moves between gears so fast and crisp that it seems to shift before my mind has completed the thought to move gears, and at the same time, it's shifting my judgments about two-by drivetrains. I've only dropped the front chain once in dozens of rides, and the added gear range provided by the 36/26-tooth chainring and 11-40 cassette has earned its keep on the steep climbs that characterize many Southern California trails. Better than the wider gear range–there are few trails I can ride with a double chainring that I couldn't also power up with a single-ring chainring, especially when opting for a small 28- or 30-tooth ring–is the capacity for recovery on long, brutal rides. On a recent 50-mile grind with some 6,300 feet of climbing, I was in the pain cave to be sure by the end, but the granny gear allowed me the chance to recover on mellow sections of fire road, and that ultimately did wonders for my endurance on a big, eight-hour day. For the cockpit, I went with Easton’s new 750-mil-wide, carbon-fiber, 35-millimiter-diameter low-rise bar and Haven bar and 35 stem. Though I've had one product manager tell me his brand has avoided making a beefier bar because its athletes reported that the extra girth actually makes the bar too stiff, I was curious to try it. As I expected, I don't ride hard enough to experience the painful arm pump that might result from a too-stiff bar, so I'm happy with the choice. The Rhyme's front-end–with its 67-degree headtube angle, solid Pike fork and stout bar and short stem combo-handles superbly well. Not to be outdone, the rear end is equally as lively due to the 16.5-inch chainstays and a low 13.2-inch bottom-bracket height. Given that, I've had surprisingly few issues clipping my pedals, especially with the 175-millimeter crank length on the size medium. 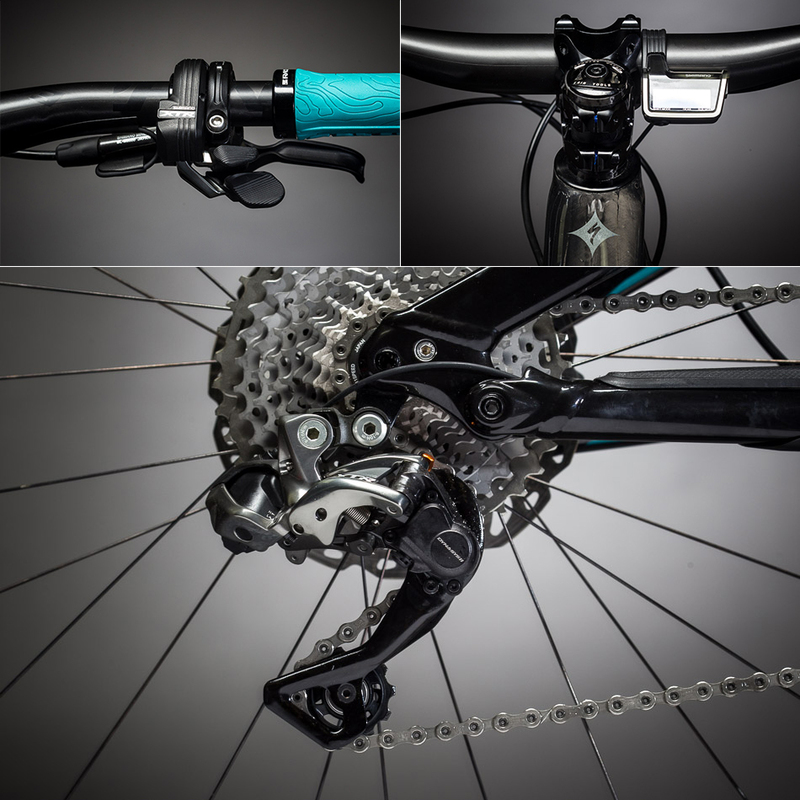 Since spending more time on SRAM's Guide Ultimate brakes in the months after I originally outfitted this dream bike, I would likely choose those stoppers for their consistent lever feel and power, despite the dependability of Shimano XT brakes. One component I didn't hesitate to keep is Specialized's new Command IRcc dropper post, which adds 10 micro-adjust clicks between the low and middle positions, and comes standard with the best-designed lever on the market. I've now logged dozens of rides of varying length, difficulty and trail conditions on the Rhyme and come away more pleased with my choice on every outing. The trail geometry–a sensible head angle, steep 74-degree seat tube and short chainstays combined with a maneuverable 44.3-inch wheelbase and quick 27.5-inch wheels–make this bike an absolute blast to ride. It doesn't feel too steep on climbs so I'm not forced to waste energy wrangling the front end, yet it's slack enough to rally descents. The Rhyme feels like the perfect trail bike–one that's certainly helped me find my rhythm.